No, Viacom still haven't pulled their fingers out and are still holding off on airing the series 19 episodes they have for... whatever reason. But since some fans are uploading HD quality, UK versions of series 19 episodes, I may as well get those out of the way, because I'm sick of waiting for Viacom, and fans are probably sick of waiting to hear my thoughts on episodes that are now a few months old. 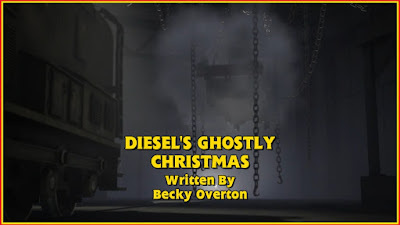 So here are my thoughts on Diesel's Ghostly Christmas! It's fair to say that adaptations of Charles Dickens' A Christmas Carol are nothing new: Disney has done quite a lot of them with several different properties throughout the years. A few British TV shows have attempted to do the same. Duncan the Humbug hinted at the story as well, but this double length episode is Thomas & Friends' true take of a full on adaptation. So, how did it do? Well... it's mediocre at best. Why? Because it's just so contrived; you would need a rather large suspension of disbelief in order to believe that half of the things that happened here would really happen in a naturally flowing story. You can believe that ghosts would know where Scrooge would be because... well, they're spirits, so they could be pretty much anywhere. But here, we're really expected to believe that Thomas, Emily, Salty and Paxton would know where Diesel would be. And Diesel goes to said places because the plot demands it. Also, how long were Paxton, Emily and Salty just hanging around where they were? Did no one even notice or question anything? Also, Thomas' plan against Diesel ends up being less of a "plan" and more capitalising on a convenient situation. Diesel rolled over the broken rail that was found earlier, and no one could have predicted that he would do so. Was the episode all that bad though? No, absolutely not. The engines' ghostly disguises were actually really creative, which I feel is a great lesson for kids: you just need imagination and the tools you have, rather than huge budgets and expensive equipment, to be creative. I'm not sure if that was the intent, but it's a great moral to teach regardless. 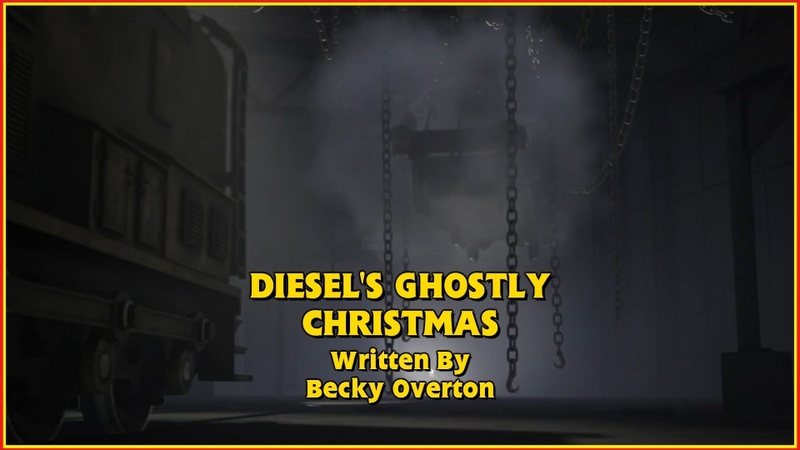 Also, Diesel's portrayal not only felt like Scrooge, but like Christopher Awdry's portrayal in Thomas & the Evil Diesel. Granted, I don't think his reform will be permanent, but if he does end up doing kind things in the future, it won't feel as out of place as it did in Diesel's Special Delivery. It's also pretty entertaining despite the contrivance. But... that's about it, really. Yeah, there are small details that are nice (a scene from Diesel Does it Again being remade in CG and used as part of Salty's flashback being a prime example), but they're not really worth bringing up as they had little impact on the story. This episode is OK, but it feels more like an experiment in order to see if they could do a double length episode. In fairness, it was successful in the fact that it's well paced; it actually felt like the story needed to be nearly 20 minutes when some can barely validate being 9. The characters were good, it had a good festive spirit and it was entertaining enough to keep me invested. That said, the contrivance is still a huge distraction. Yes, I know that you don't have a story without contrived bits in it somewhere, but this was a bit too much, especially when they weren't even hiding any of them. Maybe it could've worked better if Salty, Paxton and Thomas appeared as ghostly hallucinations? As it is, though, the episode is merely OK. Not bad by any means, but not great, and it's definitely not the best adaptation of this story that I've seen.